Corporal Suren Pratap Singh and leading seaman Ruvendaran are looking forward to their tour of duty in the Golan Heights. The duo are among the seven drivers for the Bushmaster vehicles. They had undergone an intensive three weeks training in Australia on the vehicle. The Bushmaster is an Australian-built four wheeled, all-wheel drive armoured vehicle. 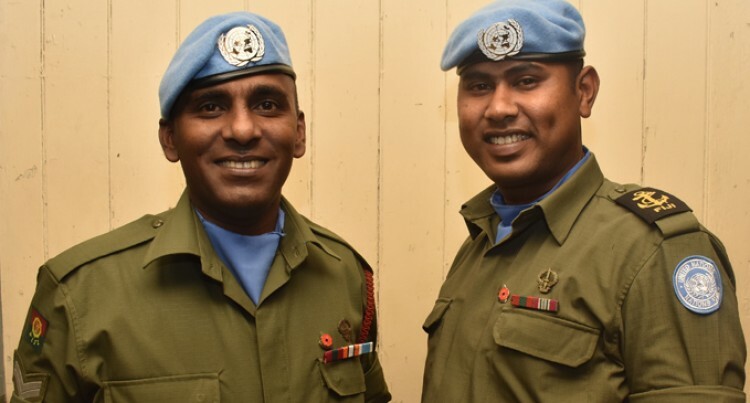 Corporal Singh, 36, originally from Bua joined the Republic of Fiji Military Forces in 2001 and this time he has a new job to do during peacekeeping under the United Nations Disengagement Observer Force (UNDOF). “Being one of the seven Bushmasters drivers and among the first Indo-Fijians in that position I feel proud,” he said. “It was an honour to have been in the Bushmasters training in Australia for three weeks because you got to drive those big and heavy vehicles. This is his fourth tour of duty (TOD). The first was in Sinai (2004), Sinai (2008) then to Iraq (2014). There has never been any regrets. During his school days at Labasa Sangam Mr Singh usually saw soldiers in uniform. “That was when I made up my mind that I wanted to be in the army,” he said. His wife and son have been his biggest source of motivation. In 2016 he was promoted to Corporal. His colleague, Ruvendaran, 30, a leading seaman joined the Fiji Navy in 2010 as an ordinary seaman. Originally from Wailevuciri in Labasa, he was inspired by his cousin in the British Army, Corporal Jiten Goundar. Ruvendaran has been promoted twice, first as an able seaman in 2012 then to his current rank last year. “This is my second tour of duty, that time there was no Bushmasters,” Mr Ruvendaran said. He was part of the Fijian contingent at the Golan Heights in 2013-2014. 215 peacekeepers departed for their tour of duty yesterday with the returning contingent expected later this week.